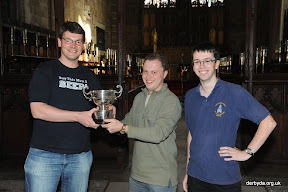 (L-R) Tony Daw from the Birmingham team receives the cup from judges Chris Poole and Simon Bond. 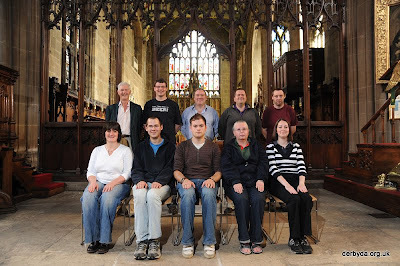 On Saturday 26 September, five bands of ringers gathered at the church of St Mary the Virgin, Nottingham, to compete for the W W Worthington Memorial Trophy. The trophy was first contested in 1978 in Burton upon Trent, with a test piece of Cambridge Royal and Stedman Caters. This year the test piece was 351 changes of Stedman Caters. This was the second time that the competition had been held in Nottingham and as in 2007 proved to be fine sunny day. The two judges, Christopher Poole and Simon Bond, were positioned in a local solicitor’s office, rather than the lofty heights of the tower roof that Robin Hall and David Hull had experienced. The draw was held at 12.45pm and the afternoon progressed smoothly; each band having 30 minutes to practice and to ring the test piece. Roger Lawson again performed the role of ‘official photographer’ and ensured that every band’s photograph was taken for the competition album. 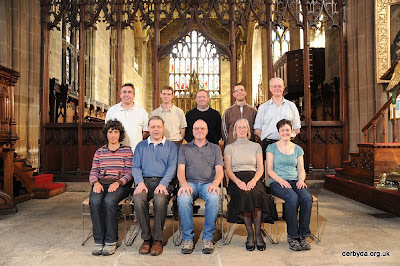 The album dates back to the early competitions and photographs from it can be found on the competition website, http://wwworthington.derbyda.org.uk/ The homemade cakes and tea that were served in the church during the ringing proved very popular; the neighbouring pubs carried on a roaring trade. 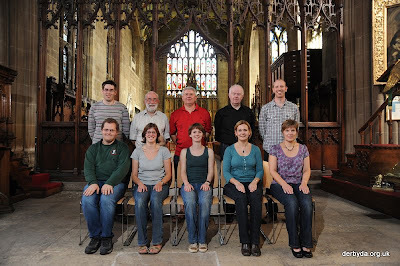 At 4pm, everyone reassembled in the church and the judges delivered their verdict. Thanks go to all who were involved with the organisation of the competition, to the church, to the judges, to the makers of cakes, and especially to all the bands and supporters who came along to make the day both successful and enjoyable. 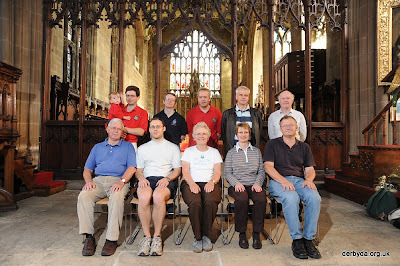 The 2010 competition will be held on Saturday 25 September at Derby Cathedral.